During F&W Cookie Week, some of our favorite digital contributors are sharing their best holiday cookie recipes in a virtual swap. Post your favorite baking experiments on Instagram using #FWCookie. Here, festive slice-and-bakes from Sarah Bolla of Lemon Fire Brigade. In this refined version of a classic old-fashioned chocolate thumbprint, cool and creamy white chocolate ganache tops these bold cocoa slice-and-bake style cookies. 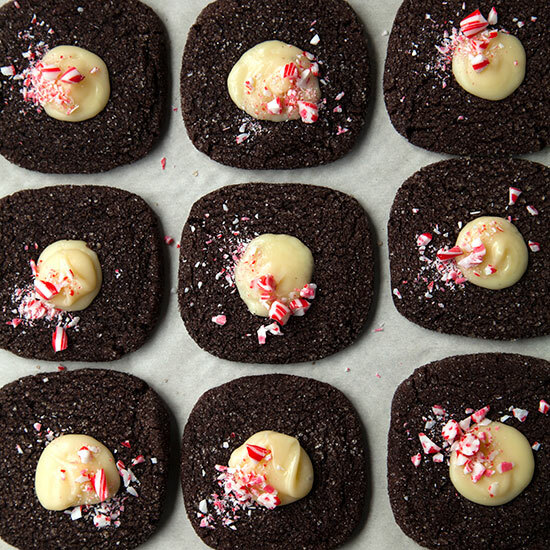 They’re chewy, intensely chocolatey, and a dusting of flaked candy cane gives them a festive finish. Arrange the racks in the lower and upper thirds of the oven and preheat to 350°F. Line two baking sheets with parchment paper. Add ½ cup of granulated sugar into a small bowl and set aside. Heat the heavy cream in a small microwave proof bowl until it begins to simmer, about 25 seconds. Pour the cream over the warm chocolate, let stand for 2 minutes. Add the confectioner’s sugar to the mixture and stir until smooth, pressing out any lumps with the back of a spoon. Add the peppermint extract and whisk until smooth, scraping down the bowl as necessary. Makes about 1 ¼ cups. *Note: If the ganache is too thick, loosen with a ½ tablespoon or more of heavy cream and whisk to combine. Make Ahead: The dough can be made 2 days in advance, keep chilled.